One of the characters that I find most interesting in the animated series Adventure Time is definitely Peppermint Butler. He started out as just another cute little citizen of the Candy Kingdom and in a position to directly serve Princess Bubblegum herself. For most of the first season, you'd probably see him reminding the Princess of an appointment or getting her something to eat or drink. But over time the folks behind Adventure Time started to create a pretty complex back story for this one candy guy. Beyond his amazing skills as a butler, he also seems to be particularly well-versed in the dark arts and is somehow a friend of Death itself. Later episodes depicted him summoning demons and calling on other dark magics as part of his, well, hobbies maybe? 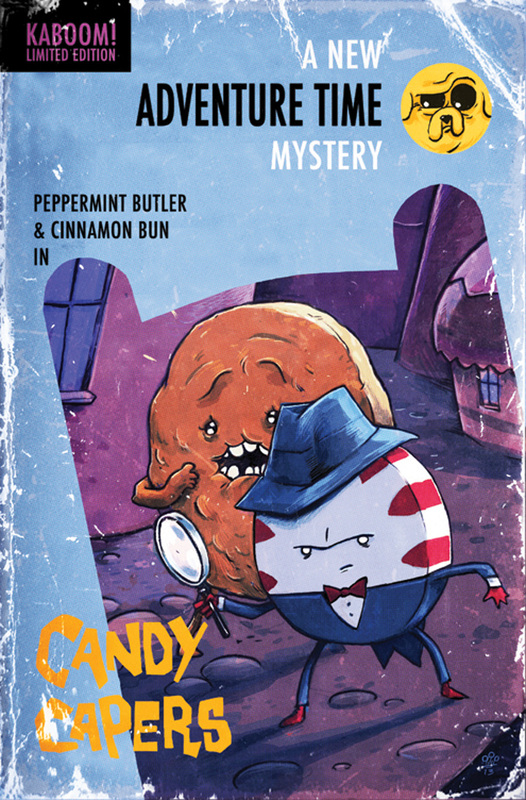 Candy Capers is a great comic that puts Peppermint Butler in the spotlight with a most unusual character as a sort of partner - Cinnamon Bun. To be fair, the more recent adventures with Cinnamon Bun in the Flame Kingdom depict a character who is a lot more interesting that his annoying, drooling self in the early seasons of the show. And the resulting adventures were pretty awesome indeed. Synopsis: Adventure Time: Candy Capers is a 6-issue comic book mini-series created by Yuko Ota and Ananth Panagariya with art by Ian McGinty under Boom! Studios. It originally ran during the second half of 2013. When Princess Bubblegum realizes that she needs a hammer that she had lent to Finn and Jake. She dispatches Peppermint Butler and almost randomly Cinnamon Bun to go fetch the hammer for her, but they are unable to locate the pair of adventurers anywhere in the kingdom. The Candy Kingdom quickly falls into disarray given their heroes aren't around, Princess Bubblegum places Peppermint Butler in charge of the Banana Guards in order to restore order. And even with the unusual help of Cinnamon Bun and the Banana Guards, Peppermint Butler quickly realizes that he needs more help. Thus he decides to enact an old Candy Kingdom edict - the Royal Hero Draft. Thus each issue in the series features a new pair of Adventure Time characters being tested out as possible heroes to replace Finn and Jake. And while each new pair does their best to solve one case or another, Peppermint Butler is also busy with the bigger case of finding out what happened to Finn and Jake. First, I really liked the initial effort to tell this story as a noir-style mystery. Peppermint Butler is a pretty rational guy and his efforts at locating new heroes while also trying to find Finn and Jake are pretty fun to follow. He's hardly perfect at this job - it just goes to show why he's primarily a supporting character. But he does the best that any supporting character can in terms of seeing the adventure through. The series as a whole runs in little vignettes - I suppose you could look at them as "cases" or something. Thus the core issues after the first feature some clever pairings of various Adventure Time characters trying to work together. Issue 2 features Marceline and Tree Trunks. Issue 3 features Lumpy Space Princess and the Earl of Lemongrab. Issue 4 features Ice King and Susan Strong. But as you can already tell, putting together such diverse characters can't result in anything productive and the rest of the series focuses on the search for Finn and Jake. I kind of expected Peppermint Butler to be a bit more, well, eldritch in his investigation methods right from the start, but of course that wouldn't make this a truly family-friend comic. At the same time, I think it nicely brought into question just how much of a master of the dark arts Peppermint Butler might actually be. More and more it seems that he may be just a dabbler in such magics and thus no one can ever come close to being more evil than Gunther the penguin. It's of no surprise to anyone of course that Finn and Jake weren't actually kidnapped or anything crazy like that. But thankfully this is knowledge that is limited to the reader and the in-story characters remain in the dark for most of the story. As much as Peppermint Butler seems to have all the trappings of a good detective, we see that his investigation doesn't immediately yield results. I really enjoyed Candy Capers - it's mostly a gateway comic that features a wide number of Adventure Time characters other than our protagonists Finn and Jake. I think we could have pushed this exploration of characters a bit more, but you can only go so far with a 6-issue TV tie-in comic. Still, on the whole it's a fun comic and it gets a good 4 instances of Peppermint Butler going all dark out of a possible 5.